Biotinylated Human BTN3A2, His Tag, Avi Tag (BT2-H82E7) is expressed from human 293 cells (HEK293). It contains AA Gln 30 - Trp 248 (Accession # P78410-1). The protein has a calculated MW of 27.3 kDa. 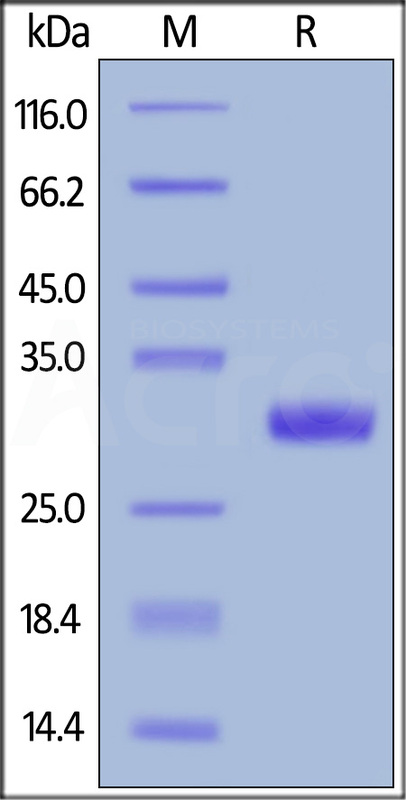 The protein migrates as 30-33 kDa under reducing (R) condition (SDS-PAGE) due to glycosylation. Biotinylated Human BTN3A2, His Tag, Avi Tag on SDS-PAGE under reducing (R) condition. The gel was stained overnight with Coomassie Blue. The purity of the protein is greater than 95%. Butyrophilin subfamily 3 member A2(BTN3A2/BT3.2) mRNA expression by tumoral cells was previously identified as a prognostic factor in a small cohort of high grade serous epithelial ovarian cancer (HG-EOC). We find that the three BTN3A isoforms: BTN3A1, BTN3A2, and BTN3A3, have high structural homology to the B7 superfamily of proteins and exist as V-shaped homodimers in solution, associating through the membrane proximal C-type Ig domain. (1) Le Page C., et al. 2012, PLoS One., 7(6), e38541. (2) Palakodeti A., et al. 2012, J Biol Chem., 287(39), 32780-90.